Publication History: This article is based on Chapter 10 of "The Log Analysis Handbook" by E. R. Crain, P.Eng., published by Pennwell Books 1986 Updated 2004. This webpage version is the copyrighted intellectual property of the author. The usual approach to calibrating permeability is to crossplot core porosity versus permeability and obtain a regression line. Unfortunately this presumes that the rock type does not change over the interval. But the technique is widely used anyway. The porosity - irreducible water saturation (Wyllie-Rose) equation offers some improvement when pore geometry varies, but regression is more difficult due to the multiple variables. 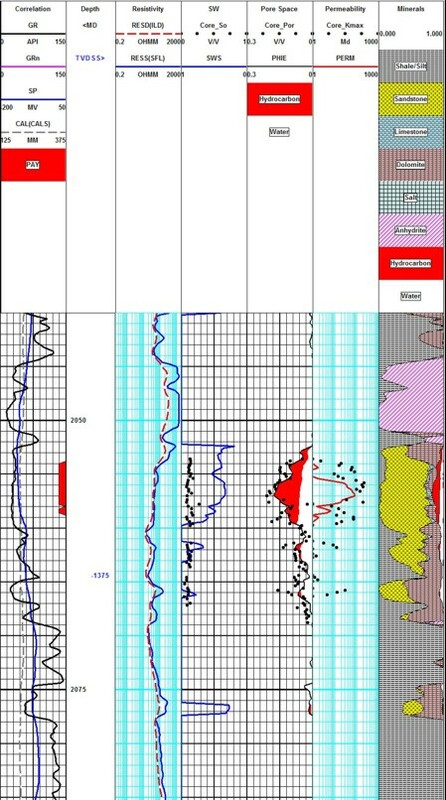 Good quality regression with a wide spread in porosity. because data has a good distribution of porosity. If there is more than one rock type in the interval, several trend lines may be evident. If data is a large splash on the plot, try to reduce scatter by zoning rock types. In fractured reservoirs, some data points with high perm and low porosity should be excluded from the curve fitting so that a matrix permeability is obtained separately from fracture permeability. 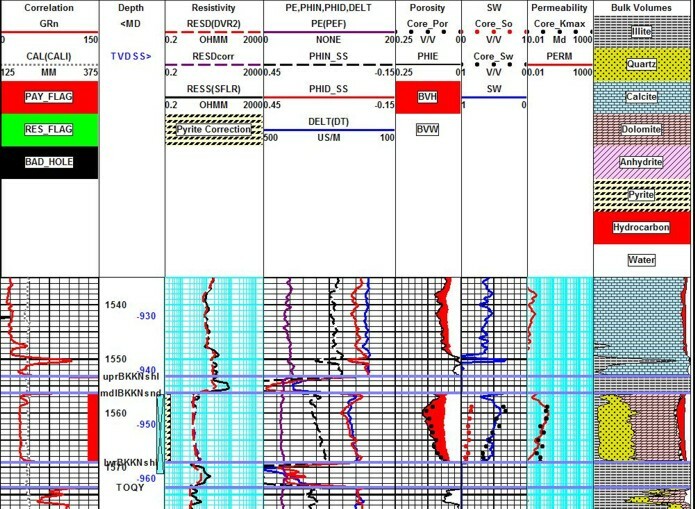 A good feel for the quality or usefulness of log analysis permeability can be obtained by crossplotting predicted productivity with actual initial productivity. Average the third to ninth month production to get a realistic initial production value. Calibrating to this data will compensate for completion hardware, stimulation, fluid type, and reservoir conditions that could not be handled with our simplified math. This is not a very reliable approach, especially in fractured reservoirs, but it is better than not checking. Drill stem test flow rates, AOF, and IPR data can also be used. Be careful to compare log analysis results from only the tested interval. The best calibration tool is feedback from a reservoir simulation. If a history match can be obtained based on the reservoir description, all is well. If reservoir volume has to be augmented or permeability doubled to get a match, then the log analysis or the reservoir maps need help. Frank and intelligent discussion between all disciplines in the analysis team will usually find where calibration is still needed. 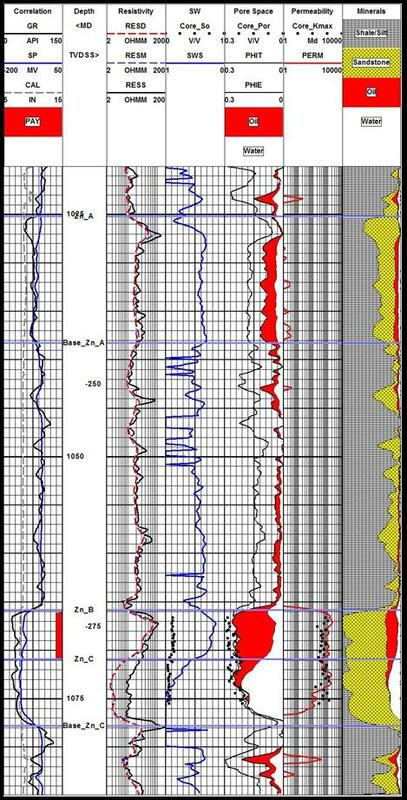 A depth plot comparison of log analysis versus core analysis permeability provides a good comparison method, often more useful than regression. The calibration can be done by trial and error, varying the parameters as needed to get a better match. Good match between log and core porosity (Track 5). Usually adjusting the constant term in the permeability equation will move the log analysis result enough to match the core data. The other exponents seldom need to be changed. 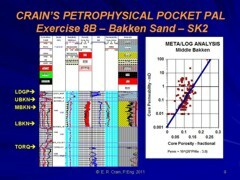 Bakken “Tight Oil” example showing core porosity (black dots), core oil saturation (red dots). core water saturation (blue dots), and permeability (red dots). Note excellent agreement between log analysis and core data. Separation between red dots and blue water saturation curve indicates significant moveable oil, even though water saturation is relatively high. Log analysis porosity is from the complex lithology model and lithology is from a 3-mineral PE-D-N model using quartz, dolomite and pyrite.